The Operating System ( OS ) is the program which is act as an interface between the user and the computer. Whenever user want to interact with the computer, operating system required. It can manage all your programs in a computer system. The UNIX OS was created in the late of 1960’s . That time it is one of the biggest system in the industry. 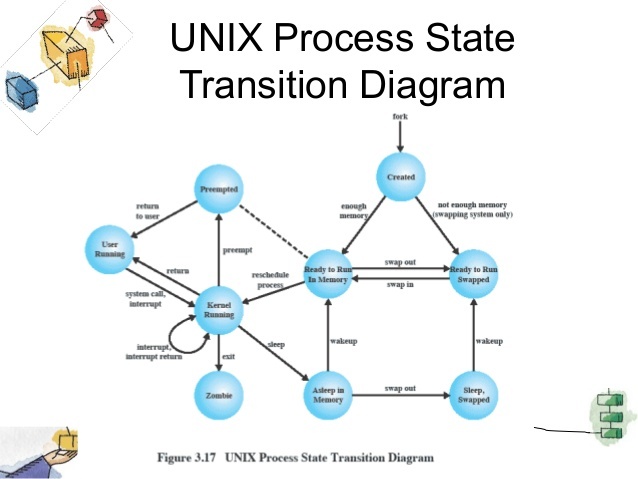 Below are some process states in UNIX OS. Whenever you can execute the programs into your UNIX Operating System, the system can create some type of environment of that particular program. This environment can contains everything needed for the system for running the program as when no any other program running in the operating system. Whenever, you get an error or issue command in this system, it creates, or starts a new process.A process, is an instance of a running program in a system. The lifetime of a process can divided into several parts or states. The following states are used in UNIX OS’. UNIX has the following four type of process states. The process in a system can be executing in user mode. The process in a system can be executing in kernal mode. The process can not executes but is ready for run as soon as kernal shedule it. If process is sleeping then it resides in the main memory ( RAM ). When process is ready to run, then swapper must swap it into the main memory before kernal shedule it for executions. The process is in sleeping mode, then swapper can swapped it into the storage device like in Hard Disk. The process also return to the kernel to user mode, bu the kernel preempts it and does a context switch to schedule another process. The process is newly created and is in a transition state in the process exists, but not ready for running nor sleeping. This state is called the start state for all the processes . When the process is executed the system call and is in the zombie state. Then process no longer exists, but it leaves a record with exit code and sometime it collects for different purpose by its parent process. The final state of the process is called the zombie state.